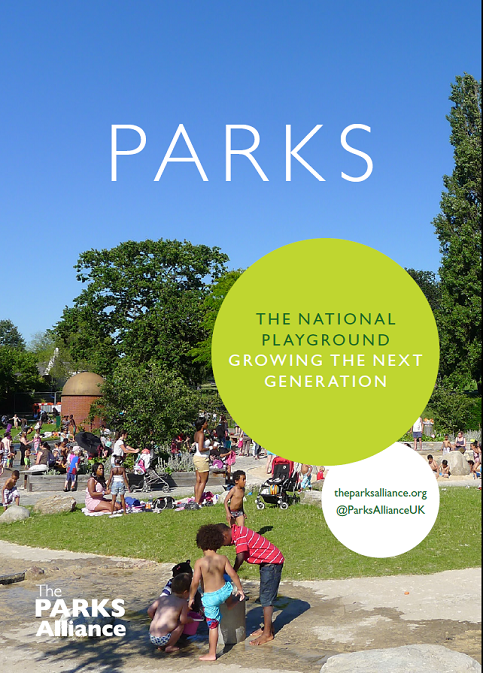 The Parks Alliance (TPA), the UK’s voice of parks, today published ‘The National Playground: growing the next generation’ on the importance of parks to family life. The current squeeze on budgets is putting our parks and green spaces at risk and data highlighted in the report show that parents with children under 10, are most concerned about the impact of budget cuts on local parks, with 7 out of 10 worried about the prospect of cuts. In this parent group, 8 out of 10 visit parks once a month, the highest number of any park users. Park visits accounted for an estimated 827 million visits taken to the natural environment in England 2014/15. Every month, on average, three quarters of children (75%) visit the natural environment with adults from their own household. Play was the dominant reason given by adults for the visits they took with children to the natural environment. 47% of children took visits that were motivated by adults wanting to play with their children and 43% took visits where the motivation was ‘to let the children play’. The report also features visitor data from three local parks in Crosby, Wheatley and Wetherby highlighting their importance to their local communities.